Food Adventures of a Comfort Cook: Meals Ring True at the Dinner Bell. Meals Ring True at the Dinner Bell. Initially, the definition of a “dive” was, “A run down, cheap, unclean restaurant or hotel.” Thanks to the Food Network Channel’s “Diners, Drive-Ins and Dives”, hosted by Guy Fieri, this definition has taken on a more modern meaning to food lovers. 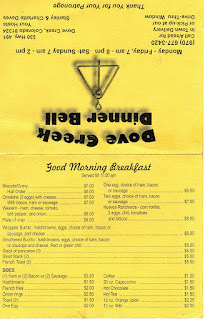 “Dive restaurants are cheap little places that may not look very nice, but serve good, low priced food.” So, if in Dove Creek, Colorado, stop into the Dove Creek Dinner Bell for that good, low priced food. I became interested in the Dinner Bell by reading comments about it, first on Facebook, and then TripAdvisor. Here’s a quote from one of the reviews, “The Dinner Bell offers basic diner foods in a charmingly cluttered and outdated atmosphere. One table, with a permanent "reserved" sign, seems to be available to the family and friends of the owners. Locals who frequent the restaurant are greeted by name.” The first sentence caught my eye immediately, so after establishing the hours of operation (Mon-Friday 7am-8 pm, Closed Saturday, Sunday 7am-2pm), off to a Sunday breakfast my husband and I did ride. Located on Main Street (Route 491), this small, white building is nondescript, but easily seen due to the large sign near the roadside. We entered, looked inside; back outside we went, then returned inside; like companions of Doctor Who, Roy and I exclaimed, “It’s bigger on the inside!”. A friendly staffer told us to sit wherever we’d like; picking a window table, we received our coffee (always a full cup) and water promptly. The menus are tucked into the condiment holder; cute little cards listing breakfast, lunch and dinner. 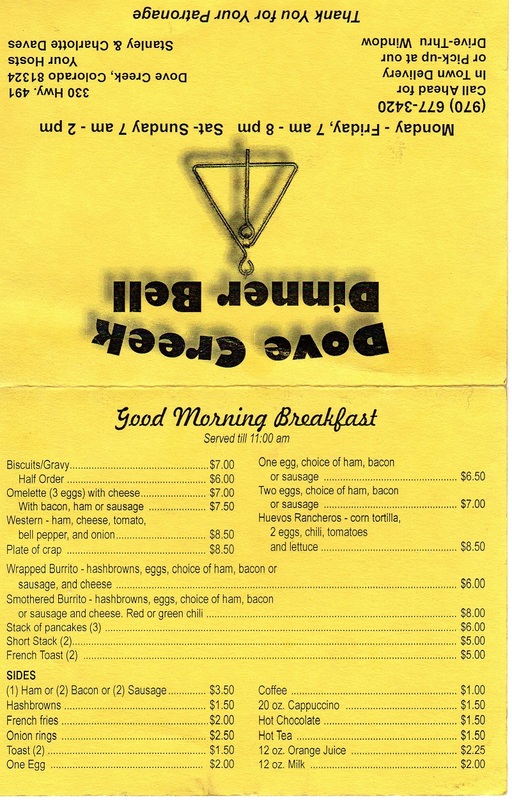 Booths are along a side wall adorned with hunting trophies, flour sack aprons for sale, and the specials board. Reviews were spot on when they said, “hunters flock to this location”, as many patrons were dressed for the occasion of deer and elk season. While I enjoyed my three egg omelet with Cheddar cheese and real bacon; my husband hungrily dug into his “Plate of Crap.” I bet your eyebrows just raised, didn’t they? “Plate of Crap” is an actual breakfast item; a construction project of hash browns, ham, sausage, eggs (3), bell peppers and whatever items are on hand; covered in a delicious green chili sauce and topped with shredded Cheddar cheese. I also indulged in the made from scratch biscuit; split open, steaming hot with pats of melting butter oozing down the sides. We attempted to work off this meal by hiking around the Abajo Mountains afterwards, but still feeling full come lunch time. Awesome breakfast! The owners, Stanley and Charlotte Daves, celebrated the five year anniversary of the Dinner Bell in September 2015. Stanley holds reign in the kitchen, while Charlotte cheerfully greets, and waits, on the customers with other staff members. The meals are prepared fresh, homemade; no time, nor patience, for prepackaged, heat in the microwave, get it out quick food. We love that, so much so, that we were back the next week to try out lunch (same menu for dinner). Half pound burgers with a luscious char on the outside; crispy French fries, and I even ordered those made from scratch biscuits to go. The Special for Sunday is usually spaghetti with garlic toast and salad; seeing other diners enjoying this, I should have ordered it too. Oh, and they do have a soup and salad bar. 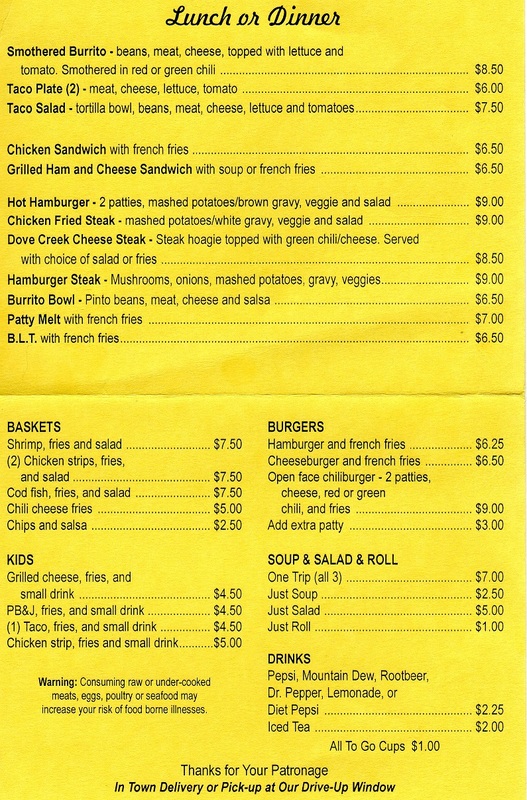 Dove Creek Dinner Bell is a small establishment, clean, homey and serving up real, homemade, fresh food. In a world full of fast food brand names, or pretentious overpriced establishments; having a comfort food restaurant is a quiet haven. 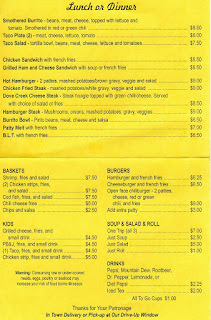 Dinner Bell also offers in-town (Dove Creek) delivery, or call in your order and pick it up at their drive-thru window.